The New England Patriots and Philadelphia Eagles don't have too big a history with each other, but they do share something unique - a Super Bowl match up. If you count Super Bowl XXXIX, the all time series record between the two is 6-6. If you don't, the Eagles lead the all-time series 6-5. This weekend's match up pits two teams against each other that are heading in two completely different directions. The Patriots are 10-1 and in control of their playoff destiny, and the Eagles are 4-7 and have suffered two straight losses while giving up 45 points in each of them. But today, we'll take a look back at what was and still is the biggest game the two teams have ever played against each other - Super Bowl XXXIX, won by the Patriots. The Patriots finished the regular season 14-2 and were the defending Super Bowl champions looking for their second straight title and third in the last four seasons. The Eagles were 13-3 and led by a dynamic offense featuring Donovan McNabb, Brian Westbrook, Terrell Owens and others. New England went through the Indianapolis Colts in the divisional round, and beat Pittsburgh on the road in the AFC Championship Game to reach the Super Bowl. The Eagles, despite not having Owens from Week 16 on due to a broken foot, got past the Minnesota Vikings and Atlanta Falcons. Owens did play in this game however, and probably would have won the game MVP award if the Eagles came out victorious. New England was a touchdown favorite, but the Eagles were more than capable of taking down the defending champions. The Eagles began the game with the ball and nearly gave it away to the Patriots when McNabb fumbled. The ball was picked up by Willie McGinest and the Pats were set up at the Philly 34-yard line. Eagles head coach Andy Reid challenged the play, and the call was overturned after it was determined that McNabb was down by contact. After a few more Eagles turnovers that the Patriots couldn't capitalize on, Philadelphia got on the board. McNabb took Philly 81 yards in nine plays and scored on a six-yard L.J. Smith touchdown catch. 7-0 Eagles, 9:55 left in the second quarter. On the Patriots' next possession, Tom Brady got the offense to the Eagles four-yard line, which was recovered by Darwin Walker. The Eagles couldn't take advantage, as New England forced them to punt. The Patriots needed a score heading into halftime, and they'd get it on the next drive. They were aided by an awful punt by Eagles punter Dirk Johnson. A 29-yard punt set the Patriots up at the Eagles' 37. With 1:10 left in the second quarter, Brady hit wide receiver David Givens for a four-yard strike to tie the game. The game went into halftime tied at 7, which was only the second time in Super Bowl history a title game was tied at halftime. As the third quarter opened, the Patriots began with the ball and widened their lead when Brady found Mike Vrabel for a two-yard touchdown reception. That drive was a result of masterful work by Brady and receiver Deion Branch, who caught four balls for 71 yards. The lead wouldn't last, though. With 3:39 left, the Eagles tied it up at 14 when McNabb hit Brian Westbrook for a 10-yard touchdown pass. McNabb drove his offense 74 yards in 10 plays. The fourth quarter began with the score still tied at 14 and the Patriots looking to regain the lead. They wouldn't have to wait long to do it. The offense went 66 yards in nine plays, and the drive was capped off by a Corey Dillon touchdown run to make it 21-14. Kevin Faulk came up huge for New England on that drive, as he caught two balls for 27 yards and had one 12-yard run. After stalling the ensuing drive by the Eagles, the Patriots extended their lead on an Adam Vinatieri field goal to make it 24-14 with a shade under nine minutes to play. On the Eagles next drive, they found themselves in New England territory looking to cut the lead, but McNabb threw the first of his two interceptions on the drive. Tedy Bruschi was able to pick the quarterback off at the Patriots' 24-yard line with 7:20 to play. The Patriots were able to shed almost a full two minutes off the clock before the Eagles got the ball back again. With 5:40 left, the Eagles cut the Patriots' lead to three by going 79 yards in 13 plays for a touchdown. However, they took so much time to score that it left them with very little time to try and tie the game. Bad clock management was a staple of the Andy Reid era in Philadelphia, and it reared its ugly head on the grandest stage. By the time the Eagles scored, there was only 1:48 left. The Eagles had to go for an onside kick, and failed to recover. The game was just about over at this point, but the Eagles had one last chance, albeit a very minuscule one. With no timeouts and situated at their four-yard line with 46 seconds to play, it was going to take a miracle for the Eagles to get within field goal range. On the first play of the drive, McNabb was being rushed and completed a pass to Westbrook at the line of scrimmage, but Westbrook couldn't get out of bounds. The clock continued to run. On second down, McNabb missed Owens, stopping the clock. This was where the Eagles' dream for a first Super Bowl title officially died. McNabb dropped back to pass and was intercepted by Rodney Harrison with nine seconds. Branch took home the game MVP honors, catching 11 passes for 133 yards. This game also marked the last time Bill Belichick, offensive coordinator Charlie Weis and defensive coordinator Romeo Crennel would coach together. Weis went on the become the head coach at Notre Dame, and Crennel became the head coach of the Cleveland Browns. 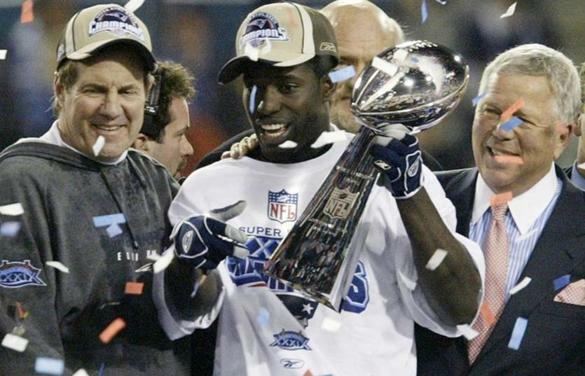 The Patriots became the first and only dynasty of the 2000's. They were now in the conversation with the Pittsburgh Steelers, Dallas Cowboys and the San Francisco 49ers as one of the all-time great dynasties. For a franchise that had been, for the most part, a joke up until Robert Kraft bought the team in 1994, being regarded as an NFL dynasty was one of the highest honors they could have received. It happened in the beginning of their run of dominance, which is still going today. Had the Red Sox not won the World Series in 2004, the Patriots dynasty would be the unquestioned No. 1 Boston sports story of that decade. To some, it may be that right now. One way or another, the Patriots' place in history was cemented. It still sits there, and there's still more time and room to add to it.